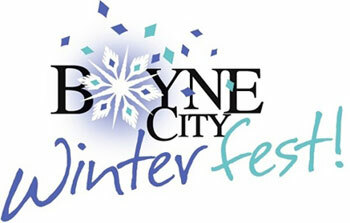 Winterfest is held in downtown Boyne City with everything family-friendly. Enjoy fun, outdoor events in a beautiful setting. Northern Michigan winter fun for the whole family! All day Indoor sidewalk sales at many downtown merchants. All day Snow sculpture contest, Sunset Park, west end of Water Street. Call 231-459-4007 to register. Snow Sculpture info and rules. All day Great sledding, ice skating and cross-country skiing at Avalanche Preserve Recreation Area, end of Wilson Street. Warming house has restrooms and free loaner skates and sleds. 9am-1pm Indoor farmers market features Winterfest Frozen Features Market Chili to taste and take home, along with other produce, meats and baked goods. In the Red Barn next to the Boyne District Library on S. Park Street. 1-3pm Kids Games with Frozen Fish Toss, Frozen Turkey Bowling. Complimentary hot chocolate and doughnuts from Family Fare Market. 1pm Boyne Mountain Cross-Country Ski Center gives free half-hour lessons at 1pm and free snowshoeing on their trails from 1-3pm. Ski rentals are available; bring your own snowshoes. 1-3pm Horse drawn sleigh rides at Old City Park, $1 per person. 2pm Chili cook off. Open to restaurants and anyone with access to a state-licensed kitchen.Call Libbie at 231-582-6554 to register, then bring one gallon of chili in a crock pot to Coldwell Banker Schmidt Realtors, 231 Water St. Tasting starts at 3pm. 3pm Cross Country Ski Tourled by Jack Laurent at Young State Park. Easy, flat trails through beautiful forest. No charge. 4-7pm Wine Tasting. Stop by the Wine Emporium, 123 Water Street, for a complimentary taste of three seasonal offerings, conversation and snacks. 5pm Snow sculpture contest with winners announced in Sunset Park. 5-6pm Star gazing with Bryan Shumaker of the Northern Michigan Astronomy Club (cloud cover permitting), in Sunset Park. 8pm Live music at Cafe Sante, One Water Street.